Your mother was right, breakfast is the most important meal of the day, but why? Most people think "It's ok, I'll eat later", or "I'm not hungry in the morning", or even "I'm trying to lose weight, so I'll skip breakfast today". Most of these people don't realize the harm they are putting their body in and the advantages that breakfast provides. For example, you wouldn't drive a car without fuel, so why would you use your body without the energy food provides? Food provides energy for the day, and tides you over until lunch time. When you wake up in the morning after your body has been in recovery mode, your glucose levels are low, and a healthy breakfast is a necessity. Parents should always be a big help to any student or child that desires a healthy breakfast. Kids can talk to their parents about healthy food choices and parents can help out their children by helping them make breakfast in the morning. Parents or a trusted adult can be relied on to help them remember breakfast in the morning. Whenever you need someone to talk to about breakfast advantages or a good breakfast to work into your diet, dieticians are always available. You can find dieticians in Mankato at Walgreens, Vitamin World, or Back to Wellness, just to name a few. Breakfast foods that are high in grains, fiber, and protein are a healthy option to start your day off right. Although many people decide not to eat breakfast before work and school, breakfast is encouraged by many different companies. Companies that sell breakfast foods, such as cereal, have many commercials and nutrition facts on their boxes, such as: Millville and Kelloggs. On the other hand, the media constantly bombards us with foods we shouldn't eat. Many people find it more convenient to stop by McDonalds or a gas station to pick up a fast and easy breakfast, that is usually not nutritious and will have negative effects on your body over time. Although McDonald's may have some healthy choices, such as salads and oatmeal, most of their food is high in fat. Their commercials and radio advertisements try to make you believe that their food is nutritious and delicious, but don't be fooled. 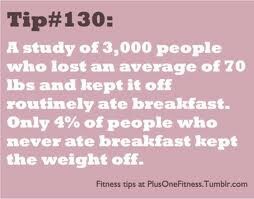 Check the facts first, if you want a healthy breakfast. Remember though, that any breakfast is better then no breakfast. Even a banana will help you in the lng run. Breakfast has many positive effects, but also negative effects from not eating breakfast. The many positive effects of breakfast include: better memory, concentration, productivity, attentiveness, mood, and creativity. 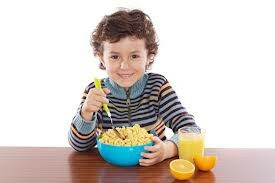 Studies show that kids who often skip breakfast are more likely to be tardy or absent from school. 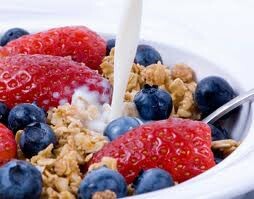 Other studies have linked breakfast to decreased chronic disease, increased longevity, and overall better health. When kids skip breakfast they are more likely to feel tired, restless, or irritable. When you don't eat a healthy breakfast it is unlikely that you will be able to make up for the vitamins and minerals a simple breakfast could provide. Further studies show a link between the School Breakfast Program to improved academic performance and psychosocial behaviors. There have been a few healthy advances in breakfast over time. Food companies are required to have a nutrition label for the food they sell, which is good for people interested in a healthy breakfast, and it lets you know what is in the food you are consuming. You can examine the food label and see if that food item is high in fiber, grains, or protein. Remember though that eating something is better then no breakfast at all. Many places are making healthier breakfast food options. For example, restaurants such as Mcdonalds have oatmeal as an option on the menu. Subway offers whole grain wheat bread for customers. Panera and Starbucks have drinks that can be ordered light, or with reduced fat in the milk. Since America's population is more obese then ever, restaurants have cut back on the fatty foods and there is now healthier options. Pretty much anywhere you go to eat has salad as an option that you can order. A local source would be http://www.wellness.com/find/dietician-nutritionist/mn/mankato which has a list of dieticians available in Mankato.